A powerful new PET radiotracer developed and tested by a team of Emory radiology faculty in partnership with faculty from several other departments has been approved for use by the U.S. Food and Drug Administration (FDA). The powerful new tracer, called 18-F fluciclovine (FACBC) and to be marketed as Axumin, underwent expedited review by the FDA. News of its approval came in June. Click here for an in-depth story. Collaboration has been key to this discovery. Mark Goodman, PhD, who directs radiopharmaceutical discovery and holds an endowed chair of imaging sciences, first developed FACBC, along with Timothy Shoup, PhD, now at Massachusetts General Hospital. Emory’s David Schuster, MD, the associate professor of Radiology who directs the Division of Nuclear Medicine and Molecular Imaging, spearheaded the translational research work on prostate cancer with colleagues in Radiology and the departments of Urology, Radiation Oncology, Pathology and Biostatistics. The urology team included associate professor Peter T. Nieh, MD; professor Viraj Master, MD, PhD, FACS; professor Muta Issa, MD, MBA, and the urology department chair, professor Martin Sanda, MD. 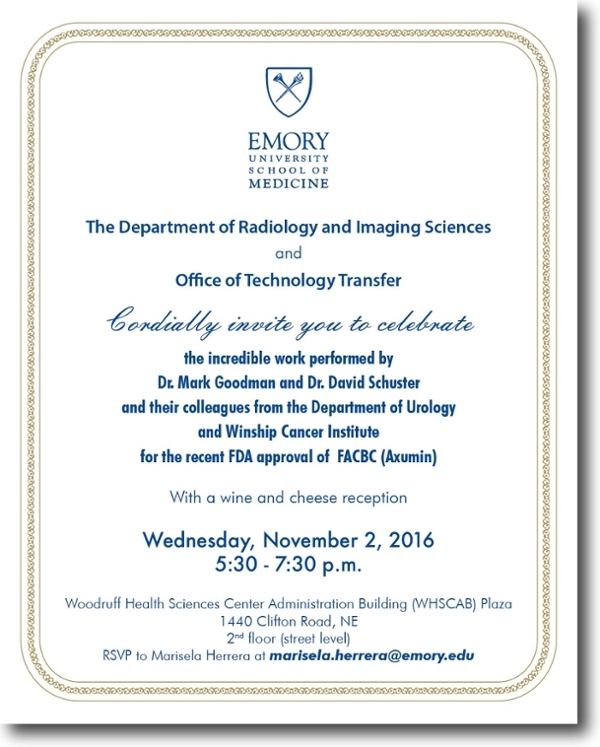 A wine and cheese reception on Wednesday, November 2nd is being sponsored by Emory Radiology and the Office of Technology Transfer to celebrate the incredible work performed by Dr. Goodman, Dr. Schuster, and their colleagues. The reception will take place from 5:30 until 7:30 pm in the School of Medicine lobby. Everyone is welcome. RSVP to Marisela Herrera at marisela.herrera@emory.edu.